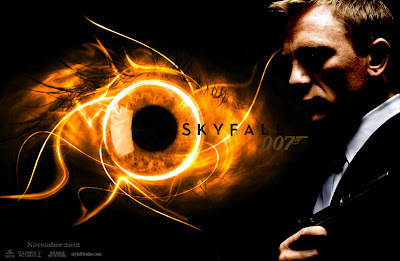 Atala - I'm not really a James Bond fan - that's more Myne's department - so I was very lukewarm about going to watch this. Still, I like to keep an open mind, as Myne's choices have turned out to be very rewarding experiences (e.g. Cloud Atlas, which I reviewed a while ago). So I went along with this, hoping I'd be charmed by the Bond magic. The film opened with a thrilling chase as James Bond (played by Daniel Craig) is in hot pursuit of a man who has stolen a hard drive with information that could compromise the safety of MI6 agents, and it ends with him getting shot and apparently falling to his death. Unfortunately, for me, that was the high point of the film - while there were several other reasonably compelling action scenes later on, none of them came close in making my eyes pop open in astonishment. In fact, I found the plot of the film rather weak - the villain of the piece is a disgruntled agent who wants revenge on Bond's superior, so he launches an elaborate plot involving computer hackery and subterranean tunnels. And the ending which - in the tradition of all thriller movies - should have ended in a titanic struggle between Bond and the villain was very flat and left me feeling "so that was it?"